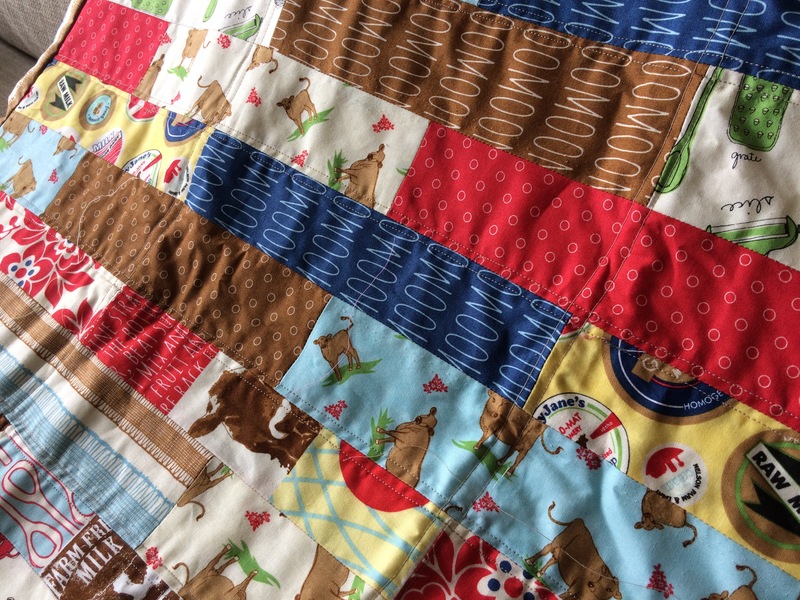 Over the past few months, I’ve shared glimpses of a quilting project I’d been working on, but never quite showed what exactly I was making. Now that the recipient has the object in question, I can show you! 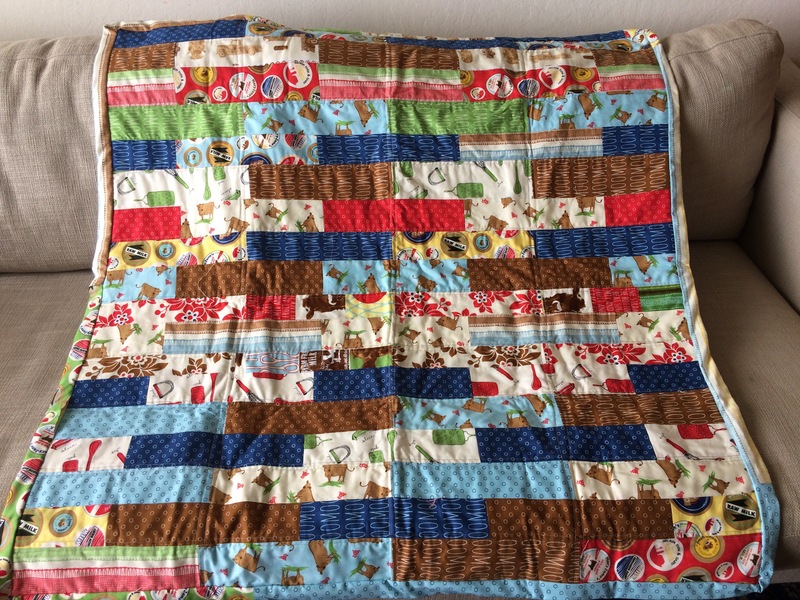 It’s a baby quilt I improvised using a package of jelly roll strips that I bought in Petaluma a few years ago. I’m using up every last bit of random small balls of yarn on these guys, and it’s been good. Tonight at knit night I finally got the courage to frog back the terrible mistakes on my Ishbel shawl. I think I’m on the right track now, thank goodness. 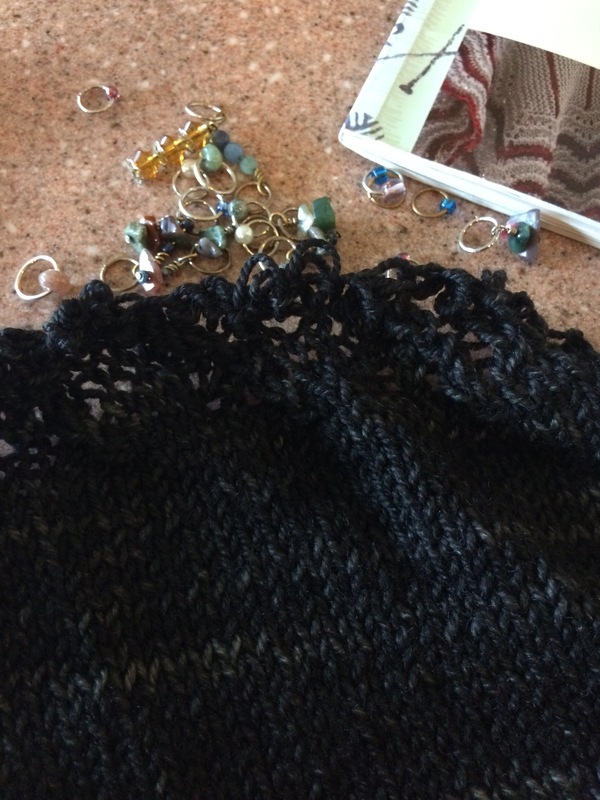 I’ve made this shawl before, so it shouldn’t be this hard. I blame fatigue. 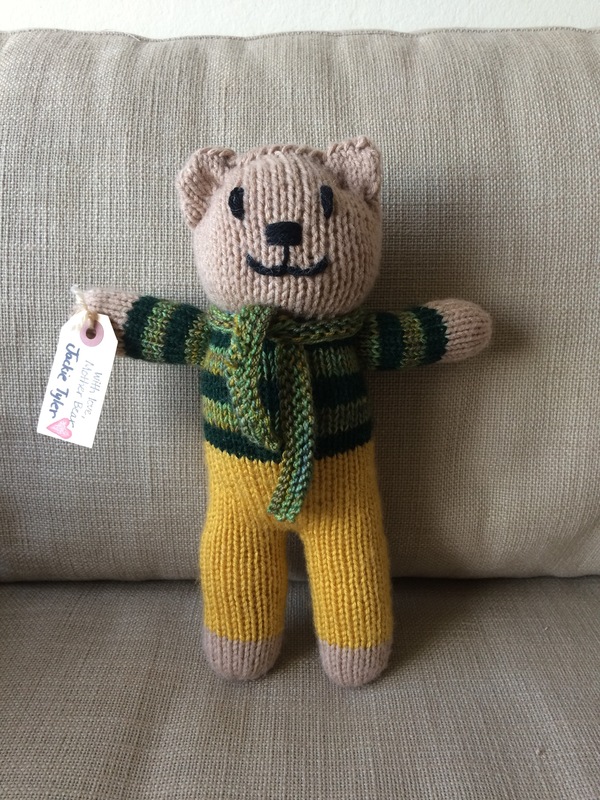 And just like that, here’s another bear FO! This is K-9, another bear named for a Dr. Who character. 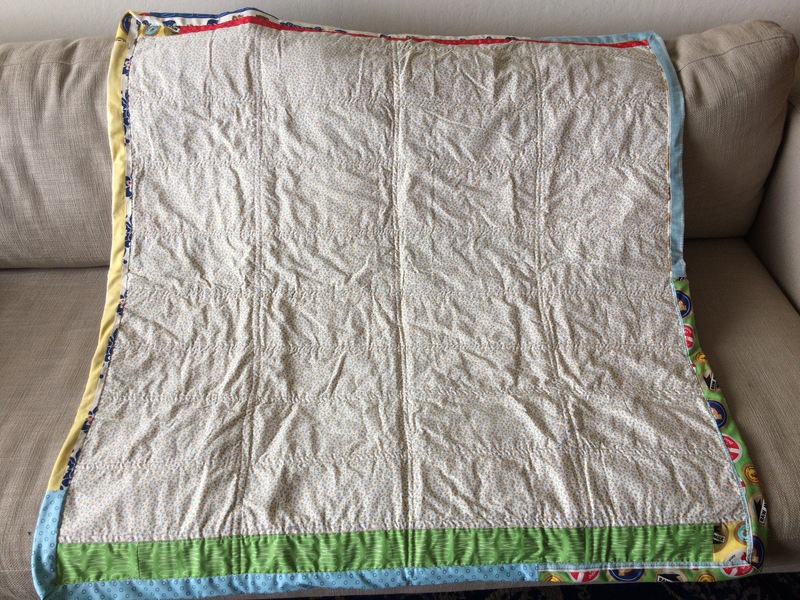 He was finished a few days ago, but I was busy, or sick…. 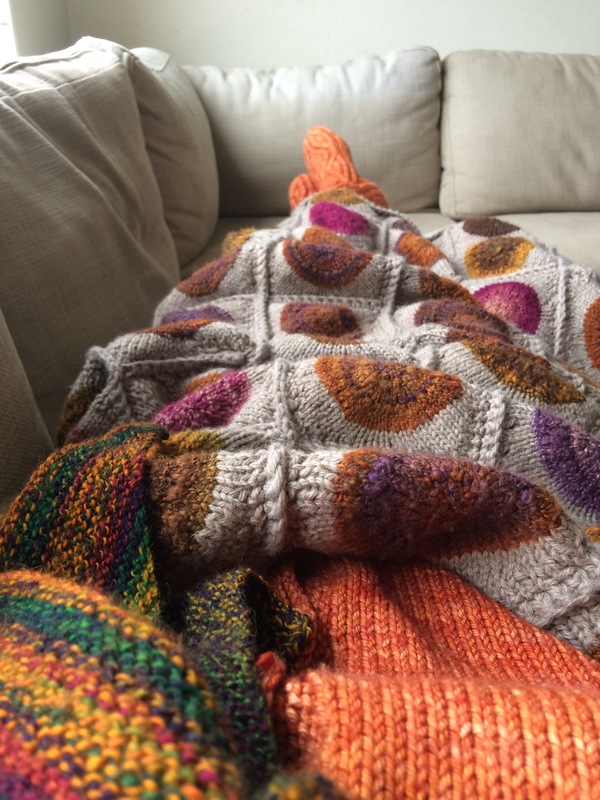 I spent Easter Day miserably on the sofa, sick with a cold but cheered by being covered in handknits. 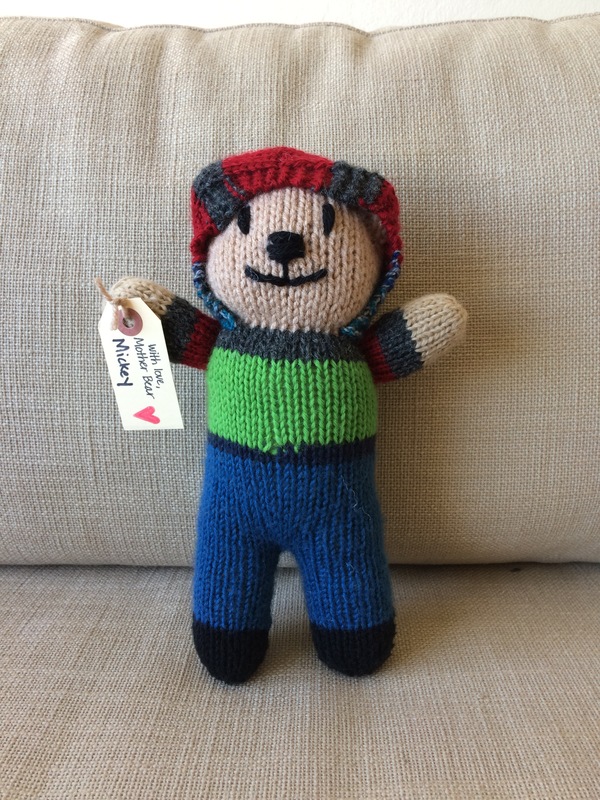 I feel much better now, thank goodness, and I’m nearly done with yet another bear. I’m on a roll, because they’re instantly gratifying, and the stash busting feels great. 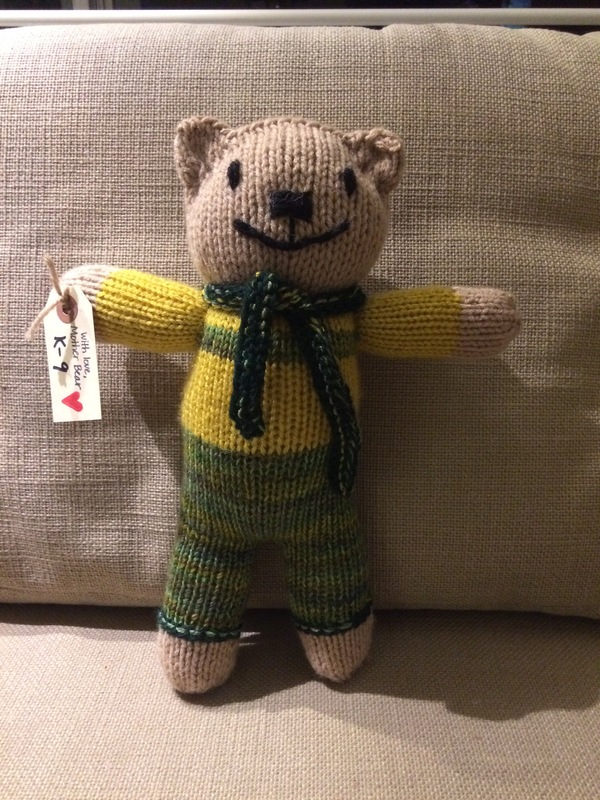 Although I am knitting almost every day, I haven’t had much to show for it lately, for a few reasons. 1) most of my projects are biggish one that are moving slowly. 2) I’ve been very distracted by the news and the book series I’m into; Percy Jackson and the Olympians. 3) I’m becoming a bilingual elementary school teacher. This one is taking lots of time and energy, as you can imagine. I have several tests to take, webinars, job fairs, interviews, paperwork, etc. I’ll start training at the end of next month, start teaching in the fall with an internship credential, and earn a Bilingual Multi-Subject Elementary School teaching credential at the end of the 2017-2018 school year. This is Jackie Tyler, named for Rose Tyler’s mother. 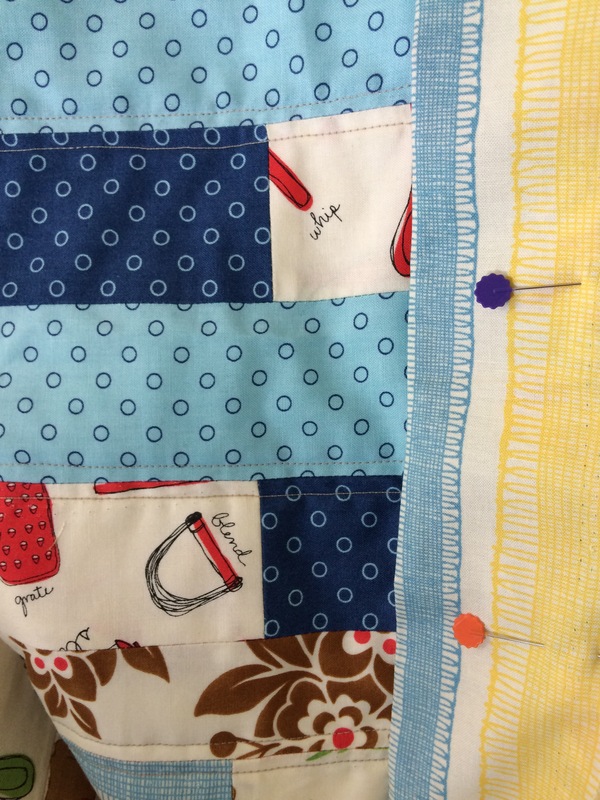 And a peek at a still-secret sewing project that only needs an hour or so before completion! I should be able to send it to its new owner on Monday morning. Yay! This evening I finished a sock, aside from the afterthought heel. I’m using three leftover balls of blue from three different sock projects (hey Marissa, maybe you have enough blue socks now….? 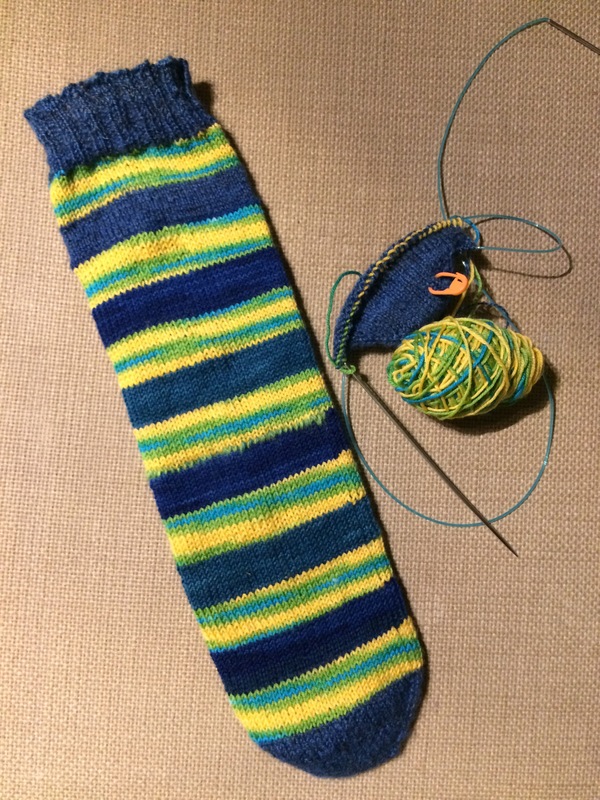 ), and the yellow/green/blue is leftover yarn from a pair of Monkey socks. I’m using every last bit of two blues, but I’ll still have yellow and the toe/cuff yarn left. I started the second sock right away, because I have a deep-seated fear of Second Sock Syndrome. I almost always knit my socks two at a time to avoid SSS, but because this was travel knitting, I wanted it to be simple, fun, and somewhat instantly gratifying. PS the metal needles didn’t make any TSA agents bat an eye. Do you prefer one or two at a time when it comes to sock knitting? On Thursday night I finished my Textured Shawl (recipe by Orlane), and blocked it. It’s squishy and warm! I managed to delete the photo, but here’s the link to my Instagram post about it. I now have a sock going on, and as I’m only doing one at a time, it seems to be coming along quickly!